Siamese fighters are part of the Osphronemidae (Gourami) family, which are well known for their ability to take oxygen directly from atmospheric air through the use of a specially designed 'labyrinth' organ. The Siamese fighter originates from Thailand (Previously called Siam) and in its natural habitats it can be found in the still waters of floodplains, ditches, ponds, rice fields and rivers. In these shallow tropical waters the temperature can regularly reach above 30C, so fighters do best when kept in warmer water (26-28C) in the aquarium. A long history of captive breeding has changed the fishes shape, colour and behaviour from the wild and bred-for-fighting forms, although elements of both remain. The commercial form has a smaller and slender body, greatly enhanced colour and longer fins, in fact fighters are available in almost any colour you can think of. Are Siamese Fighters Aggressive Fish? The name suggests that this fish is an aggressive species, but this is not the whole story. Two males will certainly fight until one is severely damaged or dead, so obviously males cannot be kept together, but aggression can also be seen towards other fish. In the vast majority of cases, this occurs when the fighters are kept with fish that exhibit long, flowing fins or bright colours, in which case the fighter may mistake them for other males. Occasionally, an individual fighter can be a 'rogue' specimen and cause problems to its tank mates but this is a rarity and it is usually the other way round. 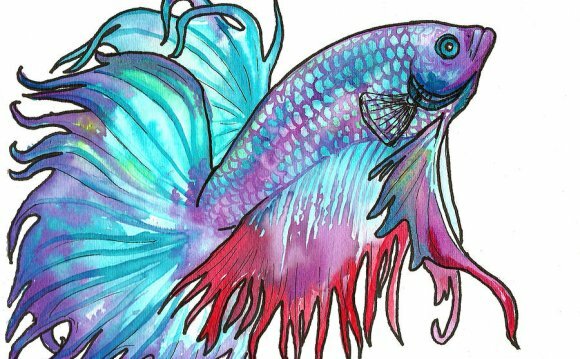 The biggest difficulty with keeping fighters is the attentions of other fish, the long flowing fins and slow-swimming nature of the fighter presents an enticing target to take an easy nip at. It is not just the usual nippy suspects that cannot resist temptation but also many fish that would normally be considered peaceful species. Some characins (tetras), barbs, and gouramies will seize the opportunity to take a nip, and if kept with such fish, a male fighter will soon become a stressed, ragged mess. Because of this you should always get good advice from your retailer or use the Think Fish Community Creator to check that the existing fish in your tank are compatible. Are Siamese Fighters a Solitary Fish? Siamese fighters are hardy, full of character, and are peaceful towards most other fish, so should they be considered a community fish? I would say not. The biggest problem is the attentions of other fish, and also the typical 'community aquarium' setup which may have lots of open spaces with a few items of decor and/or plants. Siamese fighters do not seem to enjoy open spaces, preferring a densely occupied space with lots of vegetation and objects to explore. With such specific tank mate and surroundings needs, they should really be kept in an aquarium designed specifically for them. An ideal environment would be a small aquarium (45cm+) with dense planting and a few very peaceful tank mates such as small catfish and rasboras. In this environment the siamese fighter will feel quite at home and will become an active, interesting individual which can be appreciated beyond its stunning colour and form.